The Aviation classes were privileged to have a guest speaker come to their classroom the other day. 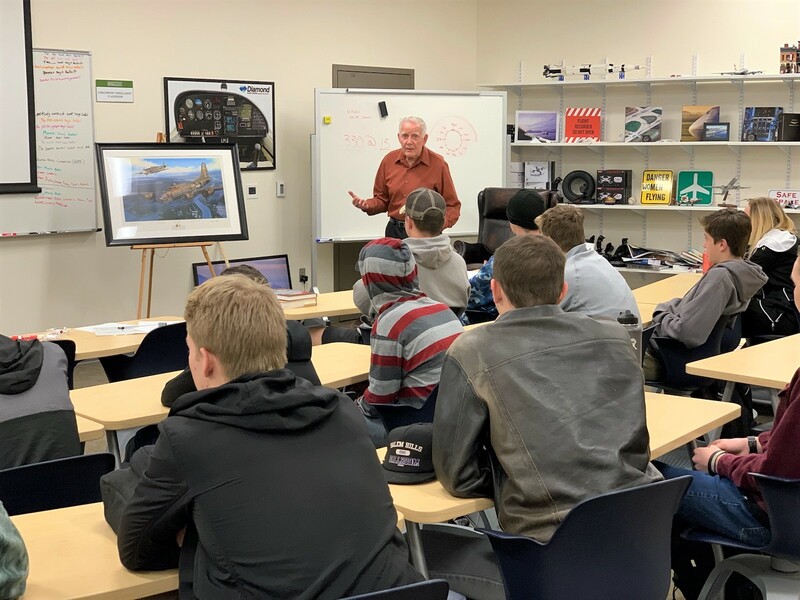 Retired United Airlines Captain and Army US Pilot, Gaylon Jorgensen took time out to come and share his experiences as a pilot with the students. The information he shared was valuable to those students and the response from the students was one of admiration. Gaylon was born and raised in Rigby, ID where his father taught him how to fly when he was 16. After serving a mission to Denmark, he joined the Army in 1952 and after basic training went to Officer Candidate School, applied for Army Flight School, then graduated as a US Army pilot. He, his wife, and two small sons then spent two years on the island of Okinawa. After five years in the Army, Gaylon landed a job with an Airline in Washington D.C. He had finally accomplished his goal of becoming an airline pilot. He spent the next 32 years showing his growing family how much fun it is to live in different parts of the USA as he lived his dream working for United Airlines. He never put a dent in an airplane, flew 12 different kinds of airliners from propellers to jets, flew as high as 42,000 feet and as fast as 725 mph and never got a speeding ticket. He has 5 children, 20 grandchildren, and 18 great-grandchildren. He’s been married twice and widowed twice. At 89 years old he has 12 gold medals from the Huntsman Senior Games, can bike faster and farther than any of his kids or grandkids, and plans to skydive on his 90th birthday this July. THANK YOU GAYLON FOR TAKING TIME TO SHARE YOUR EXPERIENCES WITH OUR STUDENTS! Thank you to Brenda Betteridge for arranging this opportunity for the students at the ALC.